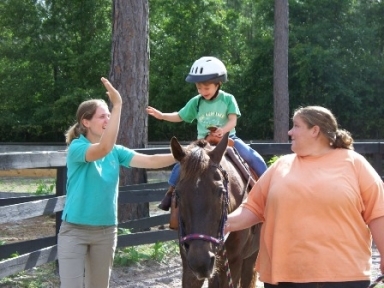 Red Oak Farms plays host to Healing Hoofbeats, Inc. a therapeutic riding program for people in the Central Panhandle. Enrollment in the program is limited to ensure a quality experiences for all participants. The Healing Hoofbeats, Inc. therapeutic riding program is open to all people with disabilities that believe they can benefit mentally, physically or emotionally from interacting with horses. Enroll today!!! See the Healing Hoofbeats website for more information on participating or becoming a volunteer. Amy is a riding instructor, trainer and owner of Red Oak Farms. Amy has been riding, showing, and working with horses for over 20 years. She has spearheaded this program beacuse she has seen and experienced first hand the healing power of horses and is excited to bring their healing powers to more people in our community. 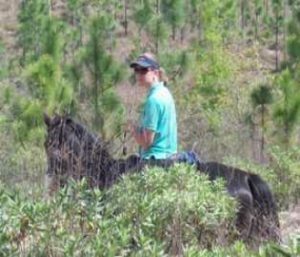 Amy has recieved recognition as a Professional Association Therapeutic Horsemen (PATH) Certified Instructor and is currently the only PATH certified riding instructor teaching in Bay and surrounding counties.